The popular Labradoodle is an energetic, friendly, and people oriented dog which has become highly sought after as a pet. The Labradoodle is a mixed dog breed, a cross between a Labrador Retriever and a Poodle. The Labradoodle may possess any combination of traits from its originating breeds. In general, they make good pets, because both Labradors and Poodles are good family pets. Both breeds are highly intelligent and enjoy being with their owners and families. When selecting a Labradoodle, look for eye disorders and hip dysplasia. Breed Type The Labradoodle is a popular mixed breed. 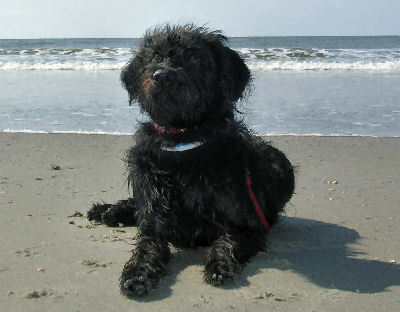 A cross between the Labrador Retriever and the Poodle (usually the Standard Poodle, but smaller sizes may be used), the Labradoodle is has become highly sought after as a pet. Background The Labradoodle was not intentionally bred until 1989. A product of Australia, the breed was intended for use as a Seeing Eye dog for the blind. The idea was to produce a dog that shed less for those who were blind and had allergies. The results were good, and the breed is still used as a guide and therapy dog. Description The Labradoodle is a mixed breed, so it does not have a defining set of characteristics that should be expected. Its hair may be soft or wiry, straight, wavy, or curly. It may or may not shed, although it usually sheds less than a full-blooded Labrador Retriever. Colors tend to be the same as those found in Poodles. Height and weight are largely unpredictable. Care and Feeding Labradors and Poodles both do well on diets that include fish and poultry, so they should be safe bets for this breed. Grooming requirements for Labradoodles vary depending on the type of coat. Clipping may or may not be required. Coats that are more Poodle-like require regular bathing, while those that resemble the Labrador's may only need an occasional dry shampoo. Maintenance of the Labradoodles environment depends on its level of shedding. Some Labradoodles will need to be cleaned up after more than others. Housing Your Dog Labradoodles should do well indoors or out. As people-oriented dogs, however, they might prefer to live indoors. Small spaces are fine, as long as ample opportunity for exercise is provided. Social Behaviors Labradoodles are usually friendly toward children, strangers, and other dogs. As with most dogs, proper socialization while young is important. Handling and Training The Labradoodle is, for the most part, easy to train. Both the Labrador Retriever and the Poodle are intelligent and love to learn new things. Activities Some Labradoodles need more exercise than others. The dog's behavior can show signs of whether it is getting the right amount of exercise. Breeding/Reproduction Some Labradoodle fans believe that only first generation Labradoodles are acceptable, while others are proponents of multigenerational crossing. Some breeders breed Labradoodles back to a Labrador or Poodle. In any event, when choosing a mate for a Labradoodle, eye disorders and hip dysplasia are primary concerns. Common Health Problems The two main genetic ailments that are common to Labradors and Poodles are eye disorders and hip dysplasia. Labradoodles may be as prone to these as members of their purebred lineage. Availability Although they only recently came into existence, Labradoodles are fairly easy to find. If you can't find a breeder locally, they can be located online. Prices vary greatly, but are often over $1,000. Are you sure the stingers are out? If the stinger is still in that could definitely be a problem. Also, the bites itch. My concern is the panting - she could be allergic to the sting. If she is panting, I'd take her to the vet. I have a question..... is the labradoodle good with cats and other dogs? From Animal World "Labradoodles are usually friendly toward children, strangers, and other dogs. As with most dogs, proper socialization while young is important". I have a 12 week old labradoodle and some one said to me I am walking him to far. We do 30 mins a day. He does not seem bothered and still runs around when he gets home. Help I am new too all of this. Lab is a HIGH energy pup - real high energy and poodles have a whole lot of energy. I think you could walk this labradoodle till you couldn't stand and the pup would still be raring to go. Don't worry about walking him too much because I doubt you can and just give lots of play toys in the home. someone said to me walk him 5 mins for every month of his life have you ever heard of this? I just got a labradoodle last week and she has tried to escape, when she is in her leash. We have been gaining her trust, but we want to be sure that she will not get out of her harness, what should we do to help train her? Firm but positive training works best. Labradoodles are one of my favorite mixed breeds. They have all the great attitude characteristics of the labrador, and the darling (non-shedding!) coat of the poodle. These dogs are intelligent, playful, and sometimes mischievous, but always seeking human connection. There are lots of good resources; books, magazines, websites and others, that can give you indepth info on training. One good method is to find a dog trainer that can offer suggestions or coaching.